Visit the AIA|LA website to learn more about the Residential Awards, or click here to see one of last year's winners, JFAK's Peace Creek Villas. Christian Robert, AIA, NCARB | R&A Architecture + Design Inc.
Visit the AIA website to learn more about the award program. 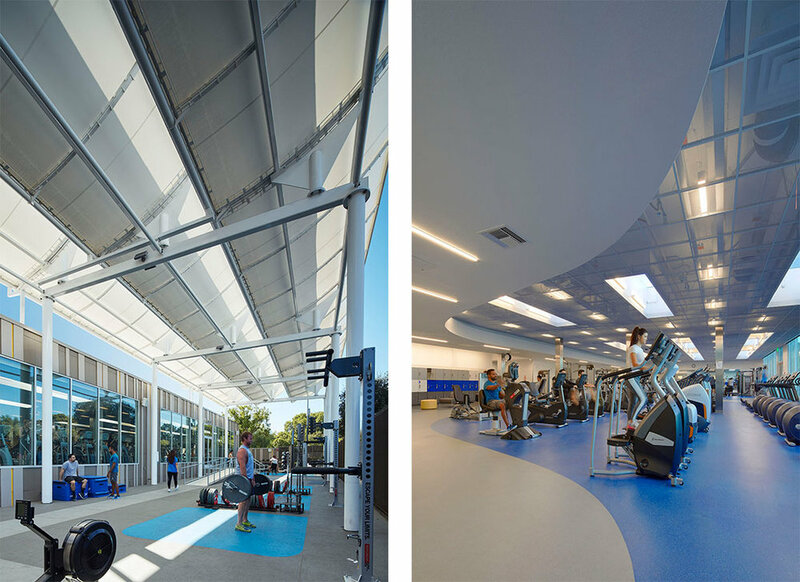 JFAK's newest project, the UCLA Kinross Recreation Center (KREC) is now open for the exclusive use of UCLA Graduate students and faculty. This 9,900 SF structure includes cardio and strength equipment, outdoor fitness area, a fitness studio and lockers. Learn more about the project here. JFAK Principal Alice Kimm was be a featured speaker at Facades+ LA, the premier conference on high-performance building enclosures. The conference unites top professionals from the worlds of design, fabrication, and construction to consider how these elements contribute to and are shaped by LA’s unique architectural landscape. This year, the conference took place at the LA Hotel in Downtown Los Angeles October 19th and 20th. Alice explored how JFAK’s process has evolved to inspire users to interact with, document, and share interior as well as exterior moments of their buildings – helping to establish stronger, more connected identities and further shape dynamic environments activated by JFAK’s foundational use of light and form. Thank you for joining us, we were happy to hear from many of our accomplished friends and colleagues! JFAK Principal Alice Kimm was on the 2017 Monterey Design Conference (MDC) Committee, which took place October 13-15, 2017. Entering its fourth decade, the Monterey Design Conference (MDC) brings together the country’s—and the world’s—leading architects and design thinkers for an intellectually vibrant weekend at Asilomar Conference Grounds in Pacific Grove, California. Designed by designers for designers, the now biennial MDC brings together a virtual Who’s Who of the design world. Learn more about the Monterey Design Conference here. LOS ANGELES, CA (February 9, 2017) - JFAK's La Kretz Innovation Campus (LKIC), home to the Los Angeles Cleantech Incubator (LACI) and LADWP, is among the five finalists chosen for the Rudy Bruner Award's 2017 Gold and Silver medal prizes. The Gold Medalist will receive $50,000 and four Silver Medalists will each receive $10,000 to enhance their projects. Celebrating its 30th anniversary this year, RBA is a biennial design award recognizing transformative places that contribute to the economic, environmental, and social vitality of American cities. Seventy-eight projects in 27 states have been honored since its founding. In 2007, JFAK's LA Design Center was awarded the Silver medal prize. RBA entries comprise completed projects across the contiguous United States. Finalists and medalists are chosen by a nationwide committee of urban experts through an in-depth evaluation process involving input from the award application, site visits, interviews with project participants and community members, and committee discussions. Next month, RBA staff will begin site visits to each finalist project in preparation for the committee’s selection of the medal winners in June. A Metropolis magazine POV blog series will document these visits, giving readers close-up experiences with each of the sites. Alice Kimm shares, "The Rudy Bruner Award for Urban Excellence honors projects that shape our cities in a positive way. For LKIC - LACI and many city agencies, in addition to JFAK and countless others, helped an almost impossible project come to life. Everyone who occupies the campus is making a difference. We are thrilled and honored to be a finalist for the RBA!" To learn more about the Rudy Bruner Award, the selection committee, and next steps for the five finalists, click here. The La Kretz Innovation Campus, designed by JFAK, was awarded a Southern California Development Forum 2016 Design Citation Award, in the Civic Category. All Award winners were celebrated at the SCDF Design Awards ceremony on December 13, 2016 at the Los Angeles City Club in Downtown Los Angeles. The annual Southern California Development Forum Design Awards recognize the contributions and commitment to the business environment and the communities of Southern California. The design awards celebrate built and un-built projects that demonstrate innovation and commitment from both: owners and design teams. The SCDF Design Awards jury was comprised of notable architects, industry media, development and engineering professionals. La Kretz Innovation Campus dedicated! JFAK, along with the Los Angeles Cleantech Incubator (LACI) and Los Angeles Department of Water and Power (LADWP) celebrated the official Grand Opening of the La Kretz Innovation Campus (LKIC), LA's new cleantech hub located in the DTLA Arts District on 5th and Hewitt, where entrepreneurs, engineers, scientists and policymakers collaborate, innovate and contribute to the creation of LA's green economy. "What’s great about the La Kretz Innovation Campus is that it's a place where community, government, and innovation in the form of technological entrepreneurship are really making a concerted attempt to connect, to find common platforms from which to work towards common aspirations," said Principal Alice Kimm. The free grand opening event celebrated LA's leadership role in achieving a cleantech future. Mayor Eric Garcetti officiated the ribbon cutting ceremony at 10:30am along with LADWP representatives, philanthropist Morton La Kretz, and notable local innovators. LACI cleantech companies shared their breakthrough sustainability solutions in fast pitch presentations and showcased their technologies at the solar-powered innovation expo. All day, local food trucks, breweries, artists and DJs showcased the diverse and vibrant culture of Los Angeles, and Downtown's Arts District. Hourly tours brought visitors through the facility features, showing off the office space and amenities. The Campus features collaborative workspace, an Advanced Prototyping Center (including a 3-D printing and laser shop, electronics, robotics and chemistry labs), a training center, amphitheater and event space, in addition to LADWP laboratories and a Case Study Home showcasing energy and water saving products, among other features. In the afternoon, JFAK Principals John Friedman and Alice Kimm were part of a lecture series, giving a presentation in which they delved into the project's genesis and evolution, entitled Green is the New Black: Designing LKIC for a Resilient Economy. Alice concluded, "As architects, we do believe that the spaces we help to make, through creative teamwork, do really advance innovation and creativity, do inspire people and the larger communities they are a part of, and do bring beauty and joy to those communities and individuals – at the same time that a conscientious deployment of current technologies helps us to live longer, healthier, and therefore more productive lives." The La Kretz Innovation Campus (LKIC) is an interdisciplinary hub where entrepreneurs, engineers, and policymakers innovate to support LA’s green economy. The campus comprises 3.2 acres, including a transformed 61,000 square-foot warehouse in the vibrant Arts District. Featuring bioswale and drought-tolerant planting, photovoltaic-shaded parking, greywater filtration and a microgrid system, the building conforms to the new CAL-Green environmental standards and LEED-Platinum status is anticipated. Visit the La Kretz Innovation Campus website here. To learn more about the LKIC project, click here. Today, Claremont McKenna College (CMC) dedicated Roberts Pavilion, the brand new 144,000 SF fitness, athletics, and events center designed by JFAK, in the presence of CMC faculty, trustees, and students. "Our hope is that Roberts Pavilion will take its place as one of the most memorable places on campus, a place where lifetime friendships will be crated, where the body and mind will be simultaneously refreshed, tested, and fused; and where social interactions of all kinds will flourish - in sum, a place where the whole person will be created and nurtured," shared JFAK Principal John Friedman during his dedication speech. Roberts Pavilion dramatically redefines the college athletic venue. An iconic social hub that brings students and faculty together, it demarks a new gateway for the campus while reacting to the push and pull of surrounding buildings, playing fields, and aquatic center. A sensuous, sculptural, even athletic form was used to suggest the College’s ambitious forward-looking outlook, as well as its function as a center of recreation and wellness. A sculpture by artist Chris Burden, installed after his death, sits just outside on the building’s plaza. The lobby's “Character Wall” incorporates important character-building terms in the ten most commonly-used languages on campus, thereby reflecting the global outlook of the College and the creative search common to all academic ventures. The dedication began with events for the CMC community, and was followed by a ribbon-cutting ceremony, reception, and dinner. Click here to see CMC's press release. Good things come to those who wait. Now the wait is over for the CMC and CMS communities; Roberts Pavilion has opened for recreational use. And it's only the beginning. As CMC President Hiram Chodosh said a few months ago during a "Senior Preview Day" at the Pavilion, "to be sure, the Pavilion is the home of CMS Athletics, but it's a facility intended for use by all students. It's an events center not just for athletics. The whole campus will be utilizing it." Chris Spells, Director of Recreation & Manager of Roberts Pavilion: "When discussing the facility, and walking through with the architects, they were pleasantly surprised at the ability to see through the facility with ease. The glass throughout Roberts Pavilion allows for one to walk in the main entrance, and instantly be able to see the track and Zinda Field on the backside. When working out in the fitness center, one can clearly see through the arena, and into the Athletics offices. This transparency really brings our goal of the building to life which is to be an inclusive, welcoming space for our community." Read the full CMC Press Release here. Join JFAK and AIA|LA for a tour of the La Kretz Innovation Campus! Mark your calendars! On September 13th, JFAK will guide visitors through the La Kretz Innovation Campus as part of the AIA|LA Tour Season. Space is limited, so reserve your spot now! At John Friedman Alice Kimm Architects, we believe in architecture’s power to transform culture and create compelling and meaningful - as well as joyful - places. Our work catalyzes creative interactions, enhances daily life, is sensitive to the environment, and advances positive social change.